RC quad copters are amazing little machines that seem to be popping up everywhere. Once upon a time a quad flyer was simply another gadget found in the arsenal of us RC fanatics. Now major corporations are going a step further by pouring vast amounts of resources into programming these little guys to do some amazing feats. 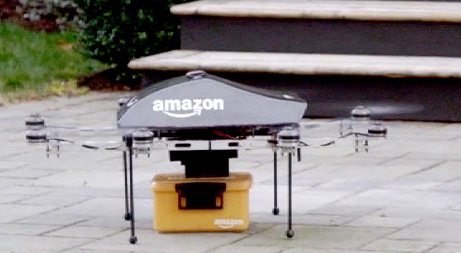 Amazon is on the brink of using multi-rotor copter drones for instant delivery of packages to customers door steps. Not sure how this will pan out. Safety issues aside, I'd be hard pressed not to kidnap one of these bad boys if it showed up on my doorstep! A "drone" is simply an RC quadcopter (or any other thing that flies) that is programmed to perform certain tasks autonomously without any further input from the pilot. There's no wonder why quads have become so popular over the past few years. As technology advances they have become smaller and cheaper to the point that most everyone can afford one. They are perfect for beginner pilots. Quadcopters make it extremely easy for anyone to capture excellent aerial footage of their homes or flying area. Not to mention they make excellent FPV platforms! How do RC Quad Copters Work? It's pretty amazing how RC quad copters are so stable that even a novice RC pilot can be hovering around chasing the cat in no time. What makes these quadcopters so easy to fly? When flying an RC airplane the fate of your bird is dependent on your stick inputs and Sir Issac Newton. Literally every movement of the airplane is directly controlled by you! It would be impossible for a human being to react quickly enough to control all four propellers of a quadcopter to hover safely, let alone fly it around! Quad copters utilize flight stabilization systems to assist the pilot in keeping the RC quad flying straight and level. 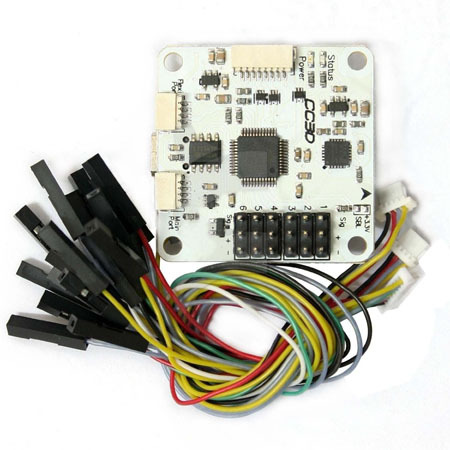 In a nut shell a tiny on-board microprocessor use feedback from accelerometers and gyroscopes to do most of the work of keeping the quad flyer hovering straight and level. Do you have a cell phone or tablet that magically keeps the contents on your screen right side up regardless of how your holding it? That's accomplished by an accelerometer which more or less determines which way is up or down. A gyroscope determines how fast something is rotating. With a quadcopter it measures pitch, yaw, and roll. The processor also mixes the inputs the transmitter to control the speeds of each rotor to allow the quadcopter to ascend, descent, pitch, and roll as the pilot dictates. The figure below gives you an idea of how the props are spinning in relation to one another for performing different maneuvers. The microprocessor is really the brain inside that does all of the heavy thinking. The REAL brain power comes from the folks that actually design and program the processors. If you're curious about the physics and math involved with programming these little gadgets read this article about Modeling and Controlling RC Quadcopters. Personally, I can't get much further than the third page before I begin to have flashbacks from my engineering classes 15 years ago at Purdue! With enough sensors quad copters can perform amazing technological feats such as autonomously flying through demanding obstacle courses in addition to stacking objects to form complex structures. An RC quadcopter is an excellent choice for your first rotary wing aircraft. Not only are they fun in and of themselves, they are perfect for getting the feel of the sticks if your goal is to move up to conventional single rotor RC aircraft. The swashplate of a single rotor RC helicopter is composed of tons of tiny fragile parts that quite frankly don't hold up well to much abuse. As explained above, the only moving parts of an RC quadcopter are the propellers themselves. If you've never flown any type of RC copter before, I highly suggest investing in a very small inexpensive mini quadcopter or micro quadcopter. The smaller it is, the less weight there is, and the less forces involved when you inevitably slam into the wall or floor. My first quad was a Heli-Max 1SQ RTF quadcopter that came with its own 2.4Ghz transmitter. Well, actually I bought it for my son, but guess who enjoyed it more?! I fly the heck out of that little thing. I crashed into the walls, floor, and ceiling more times than I could count. Granted I've went through a few propellers and had to glue the landing gear back together but she still flies! 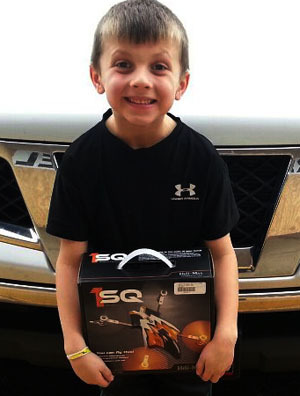 As the technology becomes cheaper and more readily available it seems that everyone is selling RC quadcopters. The search for your first easy to fly quadcopter can be a bit intimidating that's for sure. If you can afford it, I'd suggest sticking with one of the major brands such as Heli-max, Blade, Parrot, Hubsan, Syma. Even if you don't buy from Amazon.com, you can usually tell pretty quickly whether the quadflyer is decent or not just by reading the buyer reviews on Amazon. This is a great place to find brutally honest non-biased feedback. Before making your final decision on a beginner quadcopter, I highly suggest doing a quick search for spare parts availability. It's worth it to pay a little more money for your first RC quadcopter if spare parts are readily available. There's nothing more frustrating than a broken toy that you can't fix!